How fair is a garden amid the trials and passions of existence! Claudia Boulton, owner of Wild Rose Landscape & Garden Design, is passionate about plants. 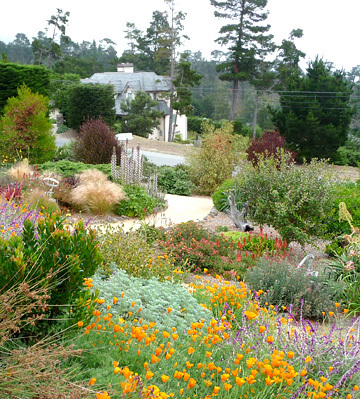 Her love of gardens has led her to help Santa Cruz County residents select and arrange the perfect plants for each spot in their residential landscapes. Central California is notoriously dry, and landscapes requiring constant attention impact both the community water supply and a homeowner's landscaping upkeep costs. Claudia considers this a highly important aspect of life in California. She keeps this in mind in each and every one of her garden designs. An expert in California native and Mediterranean plants, Claudia understands the importance of integrating native plant species for both the beautiful visual effects and for the low water use and sustainable benefits. Claudia takes great care in helping people select plants that resonate with their personal taste and style — formal, informal, modern, minimalist, cottage and tropical.